Congratulations to Darnelle Wilson, author of When a Woman Is in Love with God, who is one of three finalists for the Outskirts Press 2017 Best Book of the Year Award. The third and last finalist will be announced tomorrow on this blog – and you’ll take it from there! Public voting will determine which of the three finalists should be awarded the Outskirts Press 2017 Best Book of the Year award and its $1,500 Grand Prize. Voting is open to everyone and will take place on this blog from Monday, Sept. 11 through Friday, Sept. 15 (noon Mountain time). 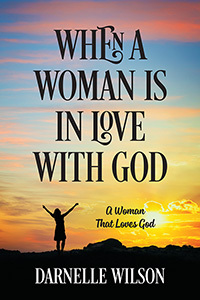 Darnelle’s spiritual book, When a Woman Is in Love with God, was published August 2016 and won a 1st Place EVVY Award in the Religion and Spirituality category just a couple of weeks ago. The book guides women through forming a loving relationship with God, thus reaping the spiritual rewards of unconditional love and salvation. When a woman loves God, she tries to please Him and do His will through daily studies of the Bible. When times are difficult, she stands on His Word and promises. Her love for Him gives her the strength to weather the storms of life. She has a safe place in the Word of God. When a woman loves God, her position in Him is anointed and appointed by God. She is bought with the precious blood of Jesus Christ. She is neither proud nor envious in her position, and pleases God as she walks in humility. God has placed her in a position to love others, even her enemies. He has given her everything she needs. Are YOU a woman who loves God? In times of trials and tribulations, when even friends and relatives have turned on you, your love for Him will sustain you. This inspirational book will encourage you to give God your unconditional love so that He will love you right into His Kingdom. 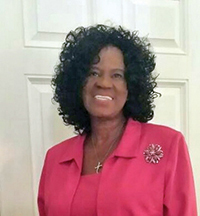 Dr. Darnelle Wilson has worked in the women ministry for more than 30 years and has taught many workshops on the work women have in the ministry for God. As a pastor’s wife and church leader, Dr. Wilson has been doing God’s work for many years. She is a woman who loves and puts God first in her life. Every year, Outskirts Press recognizes the best book they publish with their annual Outskirts Press Best Book of the Year award, which must not only win an EVVY Award from the Colorado Independent Publishers Association but must be recognized as the best book among three finalists in a public opinion poll. As finalists, Lissa Schroeder, author of Gramma Darling, and Darnelle Wilson, author of When a Woman Is in Love with God, will be competing head-to-head-to-head with the third finalist in a public poll on this blog starting on Monday. The winning author will receive a $1,500 credit to his or her Outskirts Press Publishing Center, plus an exclusive 2017 Best Book of the Year award seal to apply to the cover of their book. Tomorrow we’ll announce the final competitor. Then we need you! Come back on Monday, Sept. 11, to cast your vote for the book you believe to be the best of the three. Are you ready to publish your own award-winning book and perhaps find yourself in the running for next year’s Best Book of the Year award?